Regular measurement of INR levels is an essential component in the management of patients receiving warfarin treatment. Many factors can influence INR control so management can sometimes be challenging. Practices are encouraged to develop protocols for warfarin management, to minimise the risks and maximise the benefits of treatment for patients. Computerised decision support tools can help to achieve improved therapeutic control. International Normalised Ratio (INR) testing is well established as an integral part of warfarin treatment. 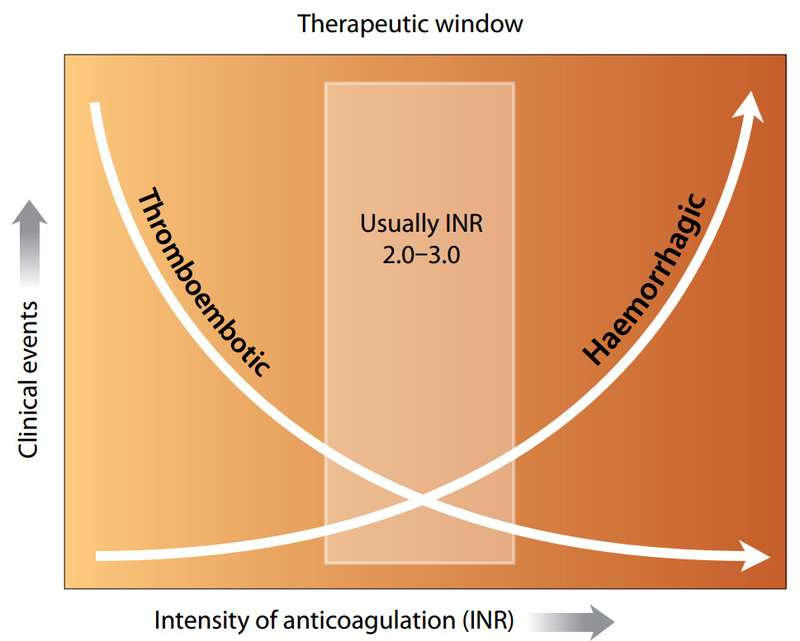 INR has a critical role in maintaining the warfarin response within a therapeutic range, to provide the benefits of anticoagulation, while avoiding the risks of haemorrhage (Figure 1). Therapeutic monitoring of warfarin treatment requires two key elements to be undertaken if it is to be successful: the measurement of the INR and an interpretation of the result in order to advise on dosage of warfarin and when the next test should be performed. It is important that practices develop a standardised management protocol for all patients treated with warfarin, in order to optimise health outcomes, by achieving tighter control. The information that a patient is on warfarin must be immediately obvious to any clinician who accesses the patient’s clinical record. Any patient on warfarin should be aware of the risks and early warning signs of bleeding, and they should be followed closely, during the first three months in particular, to ensure that the INR does not exceed 3.0. After this time period, the frequency of INR testing can be reduced. For most people once the INR is stable, the rate of INR testing can be extended to two weekly and then four to six weekly. In some stable patients the frequency may be extended out to eight weeks.4 However, people with higher levels of risk, e.g. comorbidities, may need more frequent testing. Some fluctuations in INR level can be expected, and for minor variations, changes in weekly doses are usually not required. For more significant fluctuations, use of a standard guide is important to reduce the risk of incorrect dosing. The use of dosing calendars for more complicated dosage sequencing may be of benefit. Changes in warfarin dosage may take several days to affect INR level, therefore it is important that doses are not adjusted more frequently than every four to five days. Increased consumption of alcohol (particularly binge drinking) can affect warfarin control although moderate, regular alcohol consumption has little effect. Many medicines and herbal products can interact with warfarin. An interaction can occur when the interacting agent is started or stopped or when the dose is altered. Whilst most interactions involve a change in the INR, it is important to recognise that some interactions cause an increase in bleeding without alteration of the INR, e.g. NSAIDs, aspirin and SSRIs (Table 1). Table 1 shows some of the important interactions with warfarin. It is not all-inclusive and practitioners should always check if there is a clinically significant interaction if they are prescribing a medicine for a person taking warfarin. Patients should also be advised not to take any other prescribed medicines, over-the-counter medicines or food supplements/herbal products without consulting their doctor or pharmacist. For a complete list of interactions and advice on managing interactions such as when to check the INR, refer to appropriate information resources such as a formulary or your PMS system. Interactions do not occur, or are not significant, in everyone. There are many variables including genetic factors. Congestive heart failure – may cause hepatic congestion of blood flow and inhibit warfarin metabolism, this may be particularly troublesome during exacerbations of heart failure. Hypothyroidism – decreased catabolism of vitamin K clotting factors may decrease INR values. Hyperthyroidism – conversely, hyperthyroidism may increase catabolism of vitamin K clotting factors and increase INR values. Liver failure – may cause elevation of INR due to reduced production of clotting factors. Other illnesses – other intermittent conditions such as fever, vomiting and diarrhoea may affect the INR; ill patients may also reduce their usual dietary intake. In many cases, no explanation may be found for unstable INR values. It may be worthwhile discussing aspects of the dosing regimen. Changes in the INR may also be the result of occult causes, such as undisclosed drug use, lifestyle and medical causes. A best practice Decision Support module has been developed for managing warfarin treatment, based on data from the Coventry system,17 which has been widely accepted internationally. This module is available free to General Practices in New Zealand. It enables clinicians to more easily adjust oral anticoagulant doses and schedule follow-up consultations. INR results can be tracked and monitored over time and a dose calendar can be printed for the patient. A meta-analysis of randomised controlled trials compared computerised decision support methods of determining warfarin dosage with traditional manual methods in 3416 patients.15 The computerised decision support groups did better in terms of percentage of INR tests within target (65% computer group, 59% manual group, NNT 17) and showed a significant reduction in the incidence of bleeding (2% computer group, 4.4% manual group). One of the advantages of computerised decision support tools is that information can be easily retrieved, providing many opportunities for clinical practice audit, including identifying patients who are on anticoagulant treatment but are not receiving INR monitoring. The bpacnz clinical audit “Safe and effective anticoagulation with warfarin” has been recently updated and is available to download. It is useful to also record this information in the patient’s anticoagulation record (“The Red Book”). New Zealand hospitals use a variety of warfarin initiation protocols and there is little evidence that one is any better than another. It is recommended to follow on with the protocol initiated in secondary care for patients who start warfarin in this environment. It would be helpful for primary care clinicians to become familiar with local hospital protocols. Blann AD, Fitzmaurice DA, Lip GYH. Anticoagulation in hospitals and general practice. BMJ 2003;326:153-6. Lane DA, Lip GYP. Maintaining therapeutic anticoagulation: The importance of keeping “within range”. Chest 2007;131;1277-9. Hylek EM, Evans-Molina C, Shea C, et al. Major hemorrhage and tolerability of warfarin in the first year of therapy among elderly patients with atrial fibrillation. Circulation 2007;115:2689–96. NHS Sheffield. Primary Care Trust Anticoagulation Monitoring Service standard operating procedure for the provision of a Level 3, 4 and 5 anticoagulation service. NHS Sheffield; March 2008. Available from: www.sheffield.nhs.uk/professionals/resources/anticoagulationservicespec.pdf (Accessed Nov, 2010). Kearon C, Kahn S, Agnelli G, et al. Antithrombotic therapy for venous thromboembolic disease: American College of Chest Physicians evidence-based clinical practice guidelines (8th Ed). Chest 2008;133:454S-545S. Salem D, O’Gara P, Madias C, Pauker S. Valvular and structural heart disease: American College of Chest Physicians evidence-based clinical practice guidelines (8th Ed). Chest 2008;133:593S-629S. Garcia D, Crowther MA, Ageno W. Practical management of coagulopathy associated with warfarin. BMJ 2010;340:918-20. Bpacnz. INR testing. October 2006. Available from: www.bpac.org.nz/resources/campaign/inr/bpac_inr_poem_2006_wv.pdf (Accessed Nov, 2010). Campbell P, Roberts G, Eaton V, Gallus A. Managing warfarin therapy in the community. Aust Prescr 2001;24:86-9. Schurgers LJ, Shearer M, Hamulyak K, et al. Effect of vitamin K intake on the stability of oral anticoagulant treatment: dose–response relationships in healthy subjects. Blood 2004;104:2682-9. Juurlink DN. Drug interactions with warfarin: what clinician need to know. CMAJ 2007;177(4):569-71. Jaffer A, Bragg L. Practical tips for warfarin dosing and monitoring. Cleve Clin J Med 2003;70:361-71. National Guideline Clearinghouse. Anticoagulation therapy supplement. 2006. Available from:www.guideline.gov/summary/summary.aspx?doc_id=9273 (Accessed Nov, 2010). Poller L, Wright D, Rowlands M. Prospective comparative study of computer programs used for management of wargarin. J Clin Pathol 1993;46:299-303. Bandolier. Computer decision aids for anticoagulation. Bandolier 2001; 87. Available from: www.medicine.ox.ac.uk/bandolier/band87/b87-6.html (Accessed Nov, 2010). Manotti C, Moia M, Palareti G, et al. Effect of computer-aided management on the quality of treatment in anticoagulated patients: a prospective, randomized, multicenter trial of APROAT(Automated PRogram for Oral Anticoagulant Treatment). Haematologica 2001;86(10):1060-70. Ryan PJ, Gilbert M, Rose PE. Computer control of anticoagulant dose for therapeutic management. BMJ 1989;299:1207-9. Baker RI, Coughlin PB, Gallus AS, et al. Warfarin reversal: consensus guidelines, on behalf of the Australasian Society of Thrombosis and Haemostasis. MJA 2004;181(9):492-7.